Each year, the Environmmental Working Group (EWG) issues a list of foods – the so-called ‘Dirty Dozen’ – which it considers to have the highest pesticide residues. 2019’s ‘Dirty Dozen’ list, released on March 10, includes several crops produced in New York including strawberries, apples, grapes, kale, spinach, peaches, pears, and potatoes. As in past years, the annual announcement garners significant media attention. 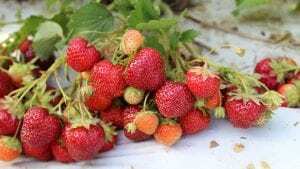 Marvin Pritts, Professor in the SIPS Horticulture Section and expert in berry production, has provided comment for several national and local news outlets, given that strawberries top the list. Pritts shares some of his concerns about EWG’s methods and conclusions here. Data used by the Environmental Working Group (EWG) counts presence/absence of a residue, but does not consider the total amount of the residue. This is not a valid method of assessing risk since the amount of a residue is what would be critical for determining if a residue is toxic. Pesticide residues in plants are miniscule and are not known to have any health effects in mammals, whether the mammal is a baby or a sensitive adult. Nearly all fruits and vegetables have levels far below (often a million times lower) levels known to cause physiological effects in humans. Just because a residue exists does not mean it is toxic at such low levels. Growers that rotate pesticides to reduce the risk of developing pesticide resistance (a recommended practice) will score more poorly on the EWG scale than growers who use large amounts of a single pesticide to control a pest. The health benefits of eating a strawberry (ranked #1 on the Dirty Dozen list) far exceed any detriment from consuming a pesticide residue. For example, strawberries have more vitamin C than oranges by weight and are high in antioxidants and nutrients. The EWG list discourages consumers from eating healthy fruits and vegetables such as spinach, tomatoes, grapes and apples that rank high on the list but are known to be extremely good for health. Consumers already eat far fewer fruits and vegetables than are recommended for good health. This is especially true for low income populations. The EWG list can do harm to low income groups by discouraging good eating habits. Residue data from crops vary greatly depending on where a crop is grown. For example, strawberries grown in the warm, wet climate of Florida receive far more pesticide applications than strawberries grown in the Northeast, yet strawberries are ranked #1 for residues regardless of how and where they are grown, disadvantaging local growers. Plants produce natural pesticides so they don’t get eaten by pests. It is estimated that the amount of naturally-produced pesticides exceed human-applied residues by 10,000-fold. The amount of synthetic pesticide residue is dwarfed by the amount of naturally-occurring pest-deterring chemicals already in plants. Human systems have developed mechanisms to detoxify naturally-occurring chemicals in the food we eat. These detoxification mechanisms work on both natural and synthetic chemicals, keeping us safe so long as these detoxification mechanisms are not overwhelmed. Organically-grown food also may contain pesticide residues. Organic growers face the same insect, fungal and weed pests as conventional growers so often will use chemical sprays to manage them. Neither the organic residues nor synthetic residues have ever been shown to be harmful to humans. The EWG approach to ranking risk is not supported by any scientific organization, has never undergone peer-review, and has never been published in a scientific journal. Recommendations regarding one’s ability to reduce pesticide residue exposure by altering eating habits are not supported by the data.